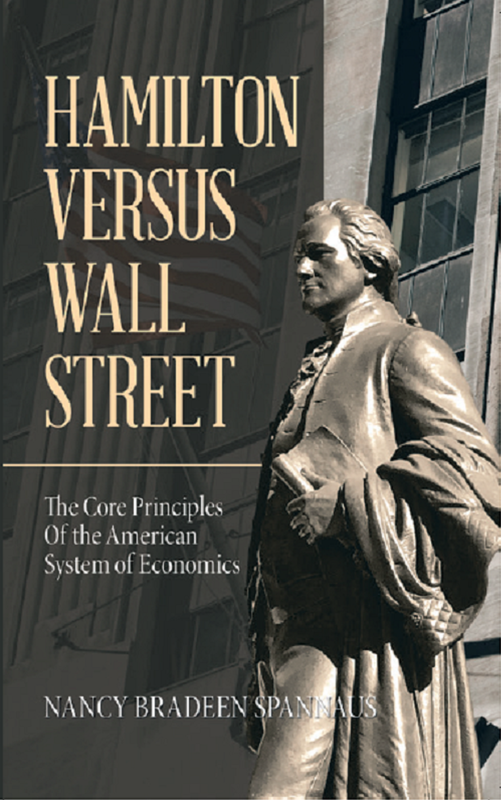 April 15, 2019—When I conceived of the polemic which shapes my book Hamilton Versus Wall Street, I knew I would be debunking the myth that Alexander Hamilton was a tool of the financial class. After reading the 2002 book Alexander Hamilton and the Persistence of Myth by Stephen F. Knott, I realize that I didn’t know the half of what I was up against. Stephen Knott, the gentleman with the beard, speaking in Washington, D.C. in 2018. A return to Hamilton could help fix much of what ails modern American politics by restoring the possibility for statesmanship and deliberation, thereby leading to a rebirth of pride among the people in their political system. Granted, the likelihood of this happening is remote. However, the prospects for this American renewal would be enhanced if a grateful nation began by acknowledging all it owes to Hamilton. Knott makes no appeal to sentiment or prejudice in his analysis of the attacks on Hamilton which have dominated his reputation over the two centuries since his death. He is painstaking in analyzing and detailing the ups and downs of Hamilton’s reputation, and the evidence on which the attacks were allegedly based. His overall conclusion is that Hamilton’s image through the centuries has been shaped by the Jeffersonian view. Thus, even those statesmen and politicians who embraced him and his policies often hesitated to praise him by name. This included Henry Clay and Abraham Lincoln, whom he admits were rooted in Hamilton’s “American System.” Lincoln praised Hamilton publicly only once, he writes—in his Cooper Union speech. As for the proponents of Hamilton, Knott concentrates on the Boston Brahmins and a number of prominent plutocrats, such as Andrew Mellon. Unfortunately, he fails to point out the irony that these defenders themselves distorted Hamilton’s policies, in order to justify their own anti-labor, usurious, monopolist policies—thus actually building up the opposition to Hamilton within much of the public. This is a weakness which I target in Hamilton Versus Wall Street, by dealing in depth with his economic policies and the principles upon which they were based. The origin of this “canard,” as Knott calls it, lies with Henry Adams, the Boston Brahmin historian descended from the Adams family of prominent revolutionaries. Adams wrote the History of the United States of America During the First Administration of Thomas Jefferson (1889), and was at pains to vindicate his hero Jefferson against the Hamiltonians. He dug up a doozy. According to Adams, Hamilton had responded to an (unnamed) supporter of democracy, with whom he was speaking at a dinner in New York City, by saying: “Your people, sir—your people is a great beast.” That tidbit, which Knott notes has “reverberated through scholarly circles to this day,” is a slanderous invention. As Knott explains, Adams found the quote in the Memoirs of Theophilus Parsons, which had been written by Parsons’ son 46 years after Parsons’ death. The son explains that his father got the story from “a friend, to whom it was related by one who was a guest at the table.” Thus a fourth hand story—which, by the way, conflicts with the life-long dedication of Hamilton to the creation of the republic—became an “authoritative source” to prove to the public that Hamilton was their enemy. Even after the commission established to celebrate the 200th anniversary of Hamilton’s birth (1957) tracked down the origin of the so-called quote, and declared it was “without basis,” the canard lived on. After all, many Hamilton opponent would argue, you can’t prove he didn’t say it, and it sounds like him to us. It shouldn’t be shocking to learn that many of Hamilton’s detractors over the centuries were died-in-the-wool racists. After all, as Lincoln said in his Cooper Union speech, Hamilton was among the three most notable anti-slavery Founding Fathers (the other two he cited being John Adams and Benjamin Franklin). But Knott’s cataloguing of Hamilton’s opponents brought some new examples to light. Henry Adams himself is highly suspect in this regard, given his quoted remarks on Jews, for example. Unfortunately, I have not read enough about him to give a definitive judgment. The same cannot be said, however, for Bowers and the literary circles with which he was associated. As Knott references, Bowers was a sympathizer with the Confederacy. And he was widely supported by the grouping known as the Southern Agrarians, such as Alan Tate, and by Ezra Pound—all of whom are renowned for their racist views. At the conclusion of his book, after a summary refutation of the slanders of Alexander Hamilton, Knott moots the possibility of a revival of Hamilton’s reputation, if not his policies. With the popularity of the musical, this revival is now underway. The Hamilton statue at the Paterson Great Falls Park. The problem is: Do people actually understand the content of Hamilton’s policies? Back in the early 1930s, according to Knott, the Democratic Party virtually accused Alexander Hamilton of having caused the Great Depression! The party used the fact that Treasury Secretary Andrew Mellon declared himself a devoted Hamiltonian, to associate the plutocratic policies of bankers like Mellon with a Treasury Secretary who would have condemned them for destroying the economy and welfare of the nation. What we need today is clarity on what Hamilton’s policies—American System policies—actually are. In Hamilton Versus Wall Street, I seek to elucidate them and their history, and spark a debate this nation desperately needs. I urge you to read the book and promote its circulation to create this result.